If you’re in the retail business, having an accurate count of your inventory can mean the difference between a happy customer and an angry customer. It can mean knowing when to reorder and restock products before they get too low, and being surprised that you just sold your last unit, and you’re looking at a three-day delivery time. Every empty shelf is the potential for a lost sale. Not just the sale on that individual product, but you often can lose the entire basket or shopping cart if you’re missing the most important thing your customer wants to purchase. Your inventory cycle is basically a three-step relationship between the supplier who provides the product, the retailer that sells the product, and the consumer who buys the product. That’s a little simplistic, but those are the most basic elements – thousands of interactions happen in between to bring this journey to life. And every interaction and piece of information is a data point that can help you manage inventory better, reduce costs and make more sales. The old way of managing inventory is basically counting inventory in, inventory out. You paid attention to what’s selling and what wasn’t by how fast the shelves emptied and how much product had to be marked down or thrown out. As seasons change and demand fluctuates, it’s easy to end up with too little or too much of one thing or another. Now there are tools that can take all of the relevant data points to paint a better picture of how you should manage your inventory. You can more accurately predict fluctuations within each season, identify the demands and desires of the customer, and make superior inventory choices, whether that’s what to stock, how much to stock and when. We know if we’re getting the inventory we need, where the inventory is coming from, how it’s packaged on the pallet, the carrier method and more. When we connect our front-end information about the consumer all the way to the back-end information, we can know when the consumer is going to purchase it and when we’re going to have to replenish it. There’s so much data available and so much potential for making more profitable decisions. One of the things retailers and suppliers need to know is a product’s inventory cycle length. That is, how often during a given period of time do you turn over 100% of the normal amount of inventory. With the data available to us know, we can calculate that more accurately than ever – if you know what to track and how to use the information. How long does it take from the moment I order the item to how long it gets onto the shelf? How long it will be on the shelf before all of them are sold out? Is my vendor reliable? Will what I order be there on time to replenish my shelves? Do I need to carry safety stock in case the vendor runs out or has an issue with production? Do I need to find a more reliable vendor? Where can I find a reliable vendor? These are just a few of the questions you may have to ask yourself to make sure that all the intricacies and points of communication for getting products in-hand need to be factored into the inventory cycle. With this information, you can create a system for managing all of that communication and build a schedule for managing inventory cycle and order timing. To help with managing inventory cycle, there has been a significant uptick in retailers that are rolling out and requiring the EDI 855 document, also known as the purchase order acknowledgment (POA). Just as the name implies, this is a message sent from the vendor or supplier acknowledging they’ve received the purchase order, and whether or not they will have all the products you need for that order. The POA helps retailers gain visibility from their vendors and suppliers on what is coming so that inventory replenishment can be better predicted. Similarly, more and more retailers are also requiring the advanced shipment notification (ASN), or EDI document 856. This document is sent from the vendor or supplier to the retailer ahead of the arrival of the impending shipment. The ASN not only lets the retailer know that the order is on its way, it holds a wealth of information on what’s included in the order, from product SKUs and quantities to expiration dates, lot numbers and tracking numbers, plus all the crucial information in between that could have an impact on inventory. SPS Commerce can help you manage your inventory cycle from start to finish and automate the process strategically. In fact, SPS Commerce can help you manage several different aspects of your inventory cycle. For one thing, our cloud-based solutions can help you identify which products are selling. By using our point-of-sale analytics, you can tell which products are popular and which are not. You can see where the sales hotspots can be found, and which regions or stores are struggling. And you can even identify the high and low seasons for your products, so you can make adjustments, find complementary products, or find new products to fill those slow times. By keeping an eye on your inventory, you can set up special inventory alerts to let you know when you need to reorder so you can avoid any out-of-stock problems. Or if you’ve got certain products that you’ll always need, no matter the time of year, you can always set it so those items are automatically reordered once your inventory reaches a certain level. Finally, all of this can be handled automatically and electronically. Rather than calling or emailing a purchase order to your suppliers, you can send an electronic purchase order through our EDI system, which will then be received by your supplier with a purchase order acknowledgment. They’ll later send an advanced shipping notification, a packing list, and an invoice, so everything can run through an automatic three-way match, which means you don’t need to have a human review all of the documents in a transaction before paying it. 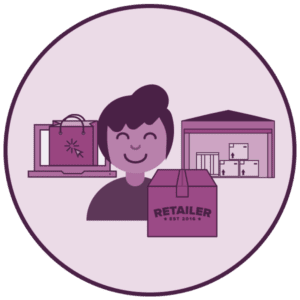 And if you need new products or have a supplier that can’t meet your inventory needs, you can always turn to our Retail Network to help you source new products and suppliers. To learn more about our different products and how they complement the entire length of the retail supply chain, please visit the SPS Commerce website. There, you can read about our products, receive a free demonstration, or ask to speak to one of our retail specialists.